I have talked about Shakshuka already in my second last blog post, however, I want to make it today’s topic again, as my Shakshuka recipe is featured in my food column of the November issue of Mio magazine by Globus. 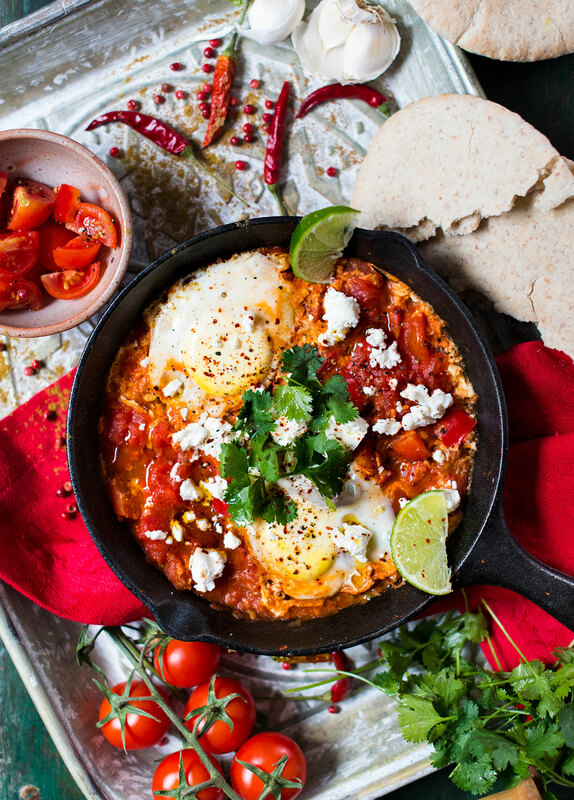 And let’s be honest: Given the current cold temperatures and grey sky, is there anyone who can resist a warming, comforting Shakshuka? 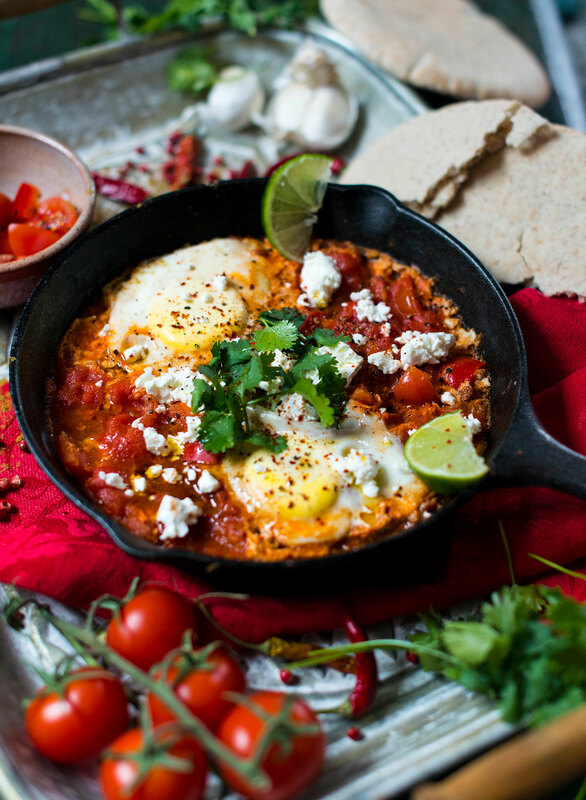 I believe that it’s not just the color that makes Shakshuka one of my favourite hearty breakfasts, but also the taste thanks to a variety of spices, and the fact that it provides us with vitamins and protein. 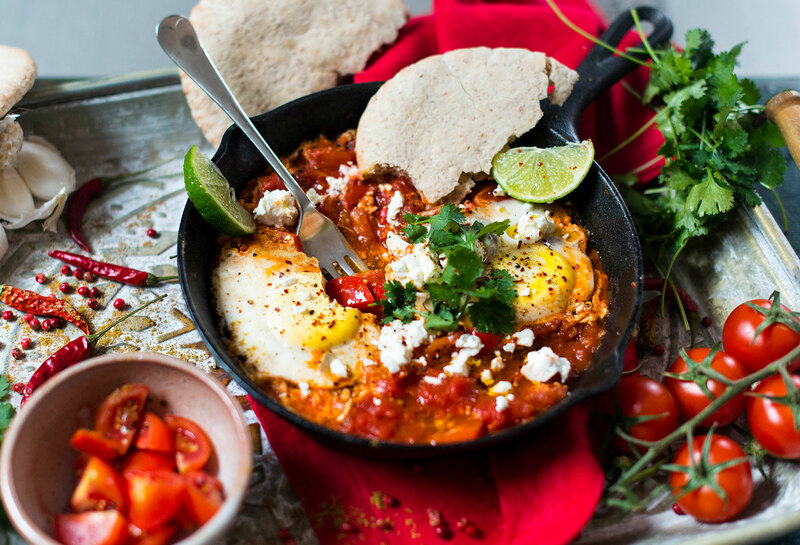 A little tipp for all breakfast skippers: Shakshuka tastes great as a dinner, too! Mazeltov! Peel and finely chop the garlic and shallot. Wash and deseed chili, chop the chili. Wash red bell pepper and cherry tomatoes, deseed the pepper and cut it in bite-sized cubes. Cut tomatoes in halves or quarters. In a medium-sized pan, heat olive oil over medium heat. Add cumin, paprika, coriander and cayenne pepper to the pan and sauté for a minute, stirring a few times. Add pepper and tomatoes, sauté for 3–5 minutes, stirring and turning occasionally. Add the canned tomatoes to the pan, simmer the vegetables over low heat. Season the vegetables with salt and pepper to taste. Break the eggs into the pan, using the vegetables and sauce as a „bed“ for the eggs. Cover the pan with a lid (optionally), allow the eggs to set. You are aiming for a stiff egg white and soft egg yolks. Season the eggs with salt and pepper to taste. 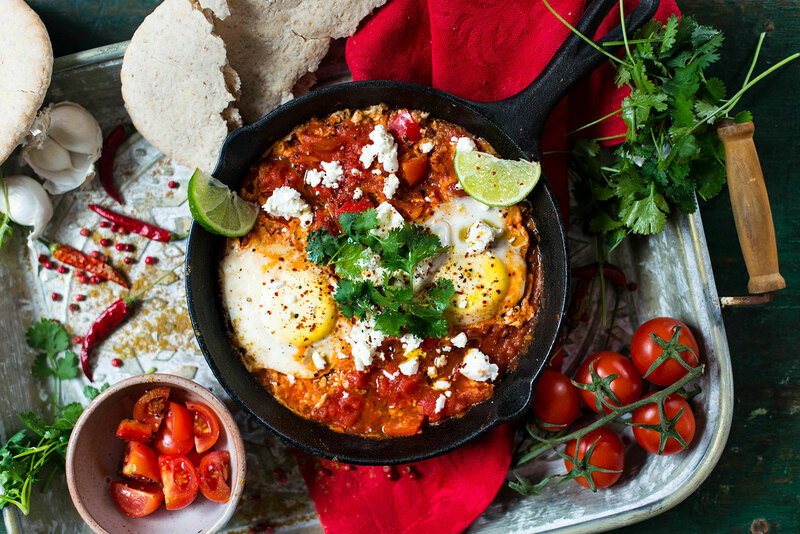 Garnish the Shakshuka with fresh coriander, crumbly feta cheese, lime juice and chili flakes (optionally), serve with pita or white bread.